The world of Hindustani Classical Music comprises of Geniuses, both vocalists and instrumentalists. Their music emanates a divine spark. Be it their first recording or a phase of experimentation or perhaps a time when they reached a crescendo in their careers, each of these is a slice of history. And we at Saregama are proud custodians of these immortal moments. In this series, we have compiled some of the finest performances of the legends, thereby showcasing the Genius of these Geniuses! Born in a family that has given to Indian classical music four generations of outstanding musicians, the Mewati Maestro had his initial grooming in music under his father, late Pandit Motiramji. He then underwent intensive tutelage under his older brother and guru, the late Sangeet Mahamahopadhyaya Pandit Maniramji. Endowed with a rich, soulful and sonorous voice which traverses effortlessly over all three and a half octaves, Panditji?s vocalizing is characterized by a harmonious blend of classic and opulent elements, projecting traditional music as an intense spiritual expression, at once chaste and densely coloured, thus touching the soul of the listener. He has been guided in this by his spiritual guru, late Maharana Jaiwant Singhji of Anand, another doyen of the Mewati gharana. Perfect diction, clarity in sur and extreme tunefulness, command in all aspects of laya, choice of composition and interplay of the notes with the words to evoke the desired mood and feeling are other highlights of this Rasraj, Pandit Jasraj?s music. Listening to him, one is transported to another world. Many aspiring students, both of Indian and foreign origins have greatly benefited due to scholarships instituted in Panditji?s name. An auditorium named after him in New York stands testimony to his greatness. Pandit Jasraj has been honoured with all the Padma Awards, Sangeet Natak Academy Award and many others. Besides, Pandit Jasraj has been honoured in the US by the Harvard University Art museum. In Vancouver he has set up the Pandit Jasraj School of Music Foundation and in New Jersey, the Pandit Jasraj Academy of Music. 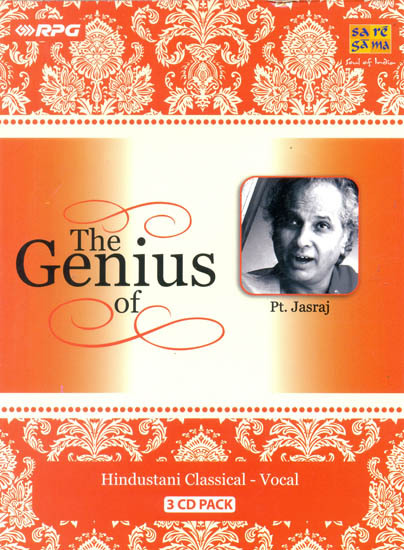 This three CD-pack encompasses the best of Pt Jasraj, thus justifying the series ?The Genius of?. CD 1 consists of 3 full-fledged Ragas. The album opens with an evening melody in Raga Gorakh Kalyan. The night Raga Kedara follows next. The soulful melody in Raga Darbari is a treat for the music lover. Pt. Jasrajji?s most popular composition ?Mata Kaalika? in raga Adaana brings this album to a close. CD 2 opens with a rendition in the morning raga Alhaiya Bilawal followed by the rare raga Gauri of Bhiarav Thaat. The final Surdas Bhajan in raga Sindh Bhairavi is a befitting end to this album. CD 3 opens with an afternoon melody in raga Madhuvanti. Jaijaiwanti, a night raga follows next. A composition in Khamaj Bahar, a ?Jod? raga is the last in this three CD pack. Pt. Jasraj?s musical genius expands over a large canvas. Our endeavor to capture a glimpse of that in this series, is more of a tribute to that legend and to his invaluable contribution to Indian Classical Music.